Everyone encounters conflict sometime during the day. It might happen when you’re trying to get out the door by a certain time, and your teenager is adamant they will take their time in the bathroom. Or perhaps it’s at work, when a colleague questions your decision. You may even encounter it with your spouse or partner on a regular basis. Conflict is a part of life. And while some people try to avoid it at all costs, there are others who embrace it—perhaps even create it—because they relish in the back-and-forth. Whether you have a love or hate relationship with conflict, it’s important that you learn how to deal with it healthily. That means not running from it, and not perpetuating it. Rather, it’s about using it as a tool to bring about a better conclusion for everyone involved. All that to say—it’s not easy navigating conflict; which is why it’s essential you have the tools you need to deal with it. This infographic by Cashnet USA shows us why our brain and body responds so readily to conflict, and gives us some handy tools to ease the tension when we sense ourselves (or someone else) having a heightened emotional response. 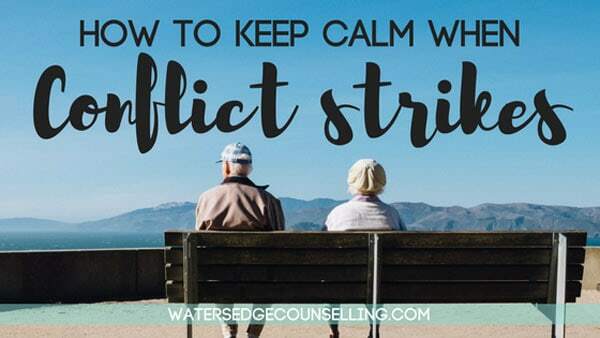 Choosing to take deep breaths, lowering your voice, changing your posture and even choosing to disengage are all helpful strategies when conflict strikes. Not only do they help you to reframe the situation, but they give the person you disagree with an opportunity to calm so you can find a peaceful resolution. Take a look at the infographic below, and see what you learn about conflict. What step can you take home with you this week? Do you run from conflict, or do you instigate it? Do you feel angry and struggle to maintain your composure during conflict? Here’s what you need to do: contact Colleen on 0434 337 245 or Duncan on 0434 331 243 for a FREE 10-minute phone consultation on how we can best help you, or press book now to book on our online diary.